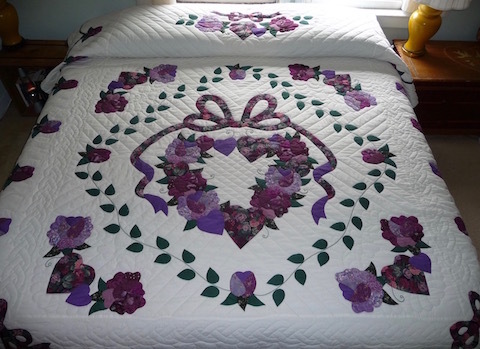 As well as being among the most difficult and time consuming patterns to execute, applique quilt patterns are among the oldest. Applique quilt and blanket fragments have been found dating back as far as 1066 in England (the oldest surviving fragment is actually Egyptian and dates to 980 B.C.). The word “applique” comes from the French and literally means “applied” or “fastened to”. Different cultures have used this technique for everything from family crests to depicting familiar flowers, animals and other items seen in daily life. 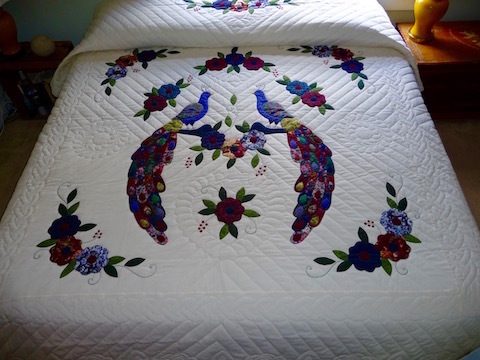 In the case of Amish applique quilts, once decided upon, the design is freehand cut and then hand sewn, piece-by-piece, to a quilt face. The quilter then hand quilts around each element to give it height and texture. 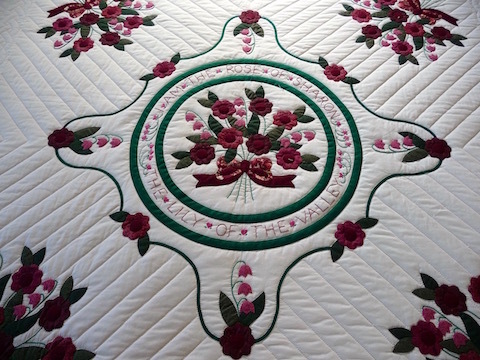 A beautiful example of a quilt pattern with a rich history (and favored by quilters) is the Rose of Sharon Lily of the Valley quilt. Our photos illustrate how the edges of every element, no matter how tiny, are turned under, then appliqued onto the quilt face with even hand stitches. While an applique quilt is time consuming to create, we certainly think it’s well worth the wait!